The early morning sun swept the chill from the air. The dry, brown grasses awaiting another spring explosion of green growth crackled and "crunched" under each step as we approached a huge pine tree. 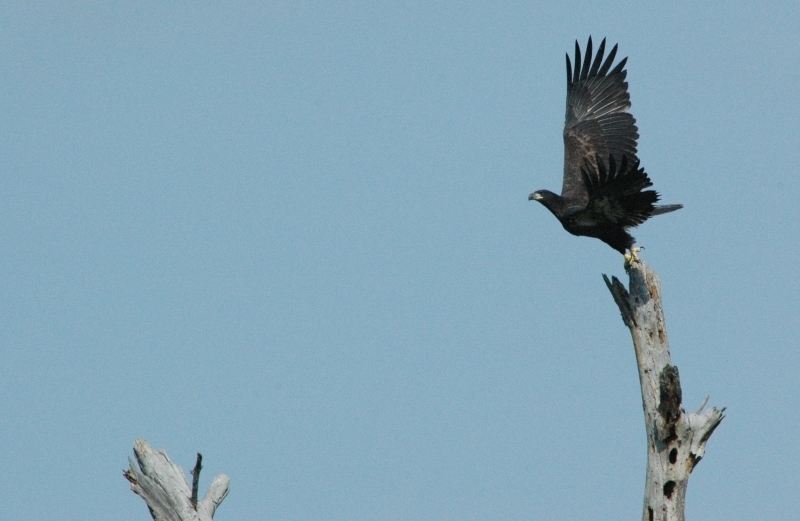 Just minutes away from Lake Fork, made famous for its' trophy bass, a pair of eagles were raising a family of three chicks. On this particular morning, the adults had already left the nest in search of food and as we watched and waited for a sign of life, either in the light blue sky or the nest, a small speck in the north-eastern sky began to grow larger and larger. 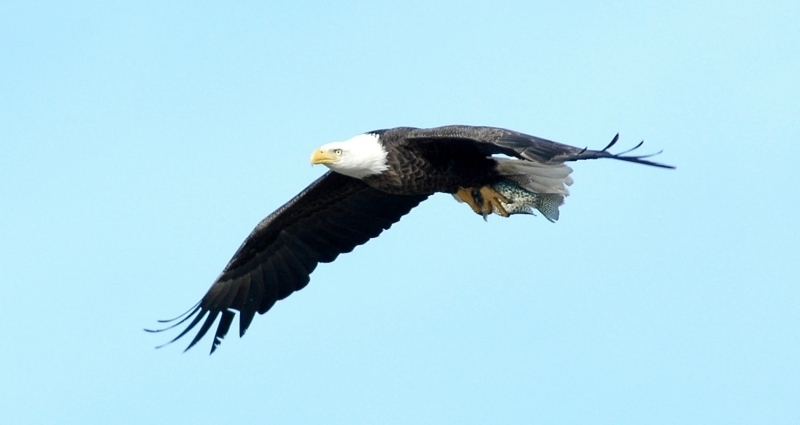 We heard the "screech" long before we could see the large fish caught in its' talons. The majestic eagle wasn't happy to find visitors near the nest which is approximately 50 feet above ground level. 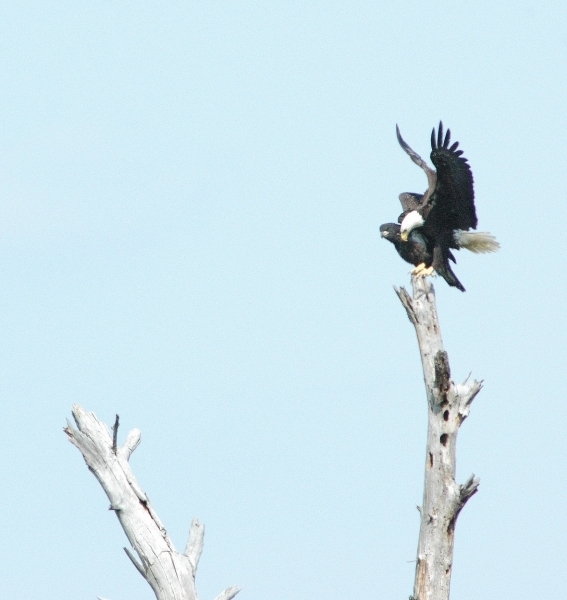 The eagle descended lower and lower, until we were looking eyeball to eyeball through the telephoto lens. It was a beautiful experience. After circling us twice, it carried the fresh meal to the chicks in the nest and within seconds it began once again to fly over our heads, sometimes dipping below tree tops in the nearby woods, as it glided through the trees, all the time voicing its' harsh displeasure. That's a scene Lynda and David Rauscher take in from their home. 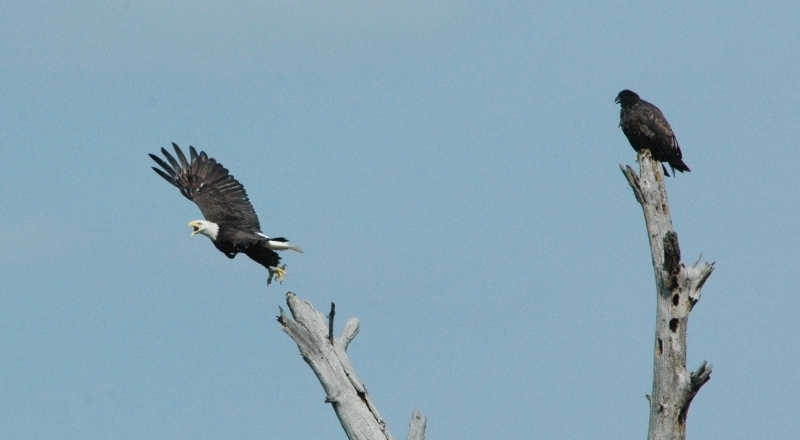 They are among the lucky Lake Fork area residents that can watch eagles daily as they help re-populate the Wood County and surrounding area. As the weeks went by and the youngsters grew, the chicks would leave the nest, walk out onto a limb and begin to flap their wings, bouncing up and down lightly as they used the branch much like a child might use a trampoline. And then one day, as the grass beneath our feet began to turn green, the first of the three "babies" flew a few short yards to another tree and then to another. Mother and father took turns demonstrating take-offs and landings and at one point when one of the babies appeared reluctant to launch from atop of a dead tree, one of the adults landed on the tiny perch, trying to force the youngster into the air once again. Nothing seemed to work for the adult and it began a series of take-offs and landings, to teach by example and finally it worked and the youngster took off. 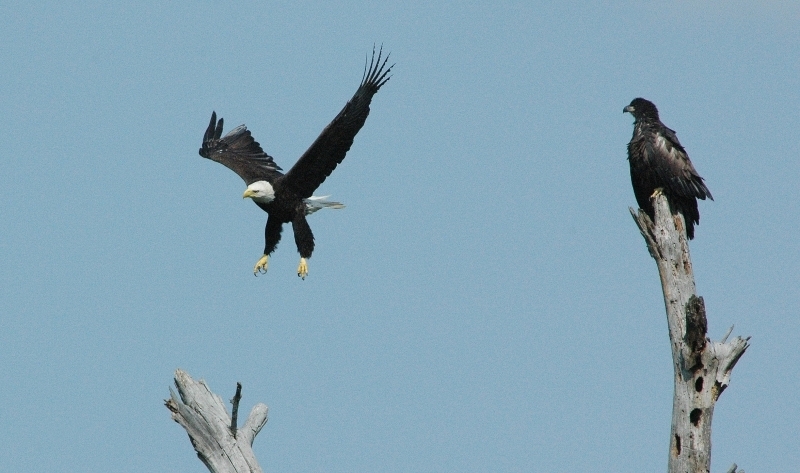 While many eagles in East Texas appear to leave for cooler surroundings in the heat of summer, this particular pair has remained at their Wood County nest for all but the hottest months of August and September. "We don't take them for granted," said David, who along with his wife Lynda owns the 30 acres where the eagles decided to build their home. By November the birds are already beginning to repair and add to the size of their nest each year and sometime around January, Rauscher said, they lay their egg or eggs. Then the wait begins. The question for the Rauschers is always the same, "Will they hatch one or more eggs?" 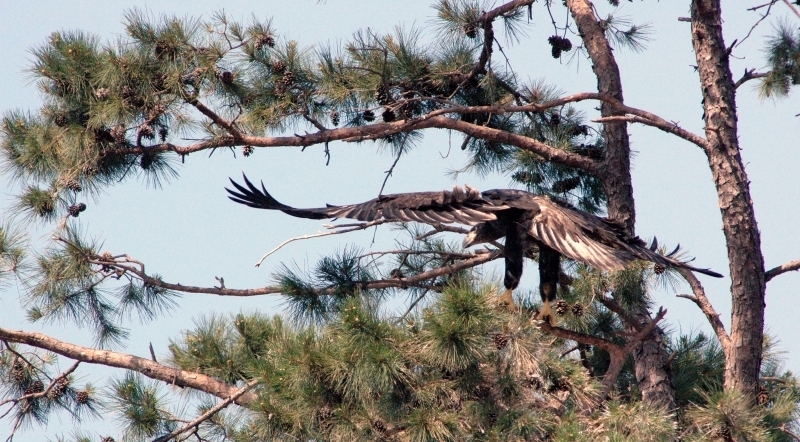 It's about a five minute eagle flight from the nest to Lake Fork and nearby Emory. In that general area there are a number of nests. Each year locals celebrate the growing number of eagles that make Wood County and adjacent counties their destination of choice to spend the winter. Eagle Fest is held yearly the second weekend of February. 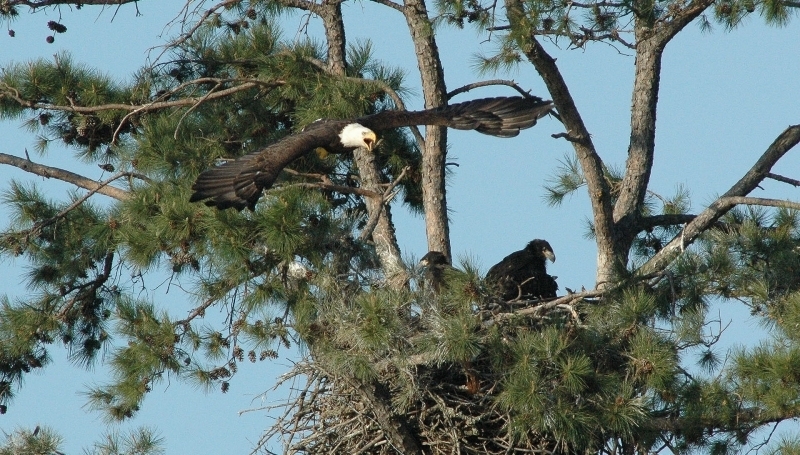 For more information about Eagle Fest and East Texas eagles, visit eaglefest.org or call 1-800-561-1182.